By default, if you forget your PAWS password, you are required to come to the ITS Help Desk with a photo ID to have it reset. However, there is an option of setting up a Password Reset Question which will give you the ability to reset your PAWS password online. This will prevent unnecessary trips to the Help Desk. 1. Log into the myLSU Portal. 2. Click Personal Preferences | Password Reset Question. 3. Select I Accept, if prompted to select Password Reset Question. 4. 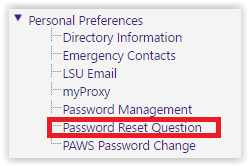 Choose your Password Reset Question from the drop-down list, then type the answer in the box underneath it. What big secret do you know that you aren't supposed to know? What is the first thing you wanted to be when you grew up? What is the title of your favorite book? What is your favorite boy or girl name? What is your favorite graffiti? What is your favorite joke punch line? What is your favorite line from your favorite author? What is your favorite line from your favorite movie? What is your favorite line from your favorite poem? What is your favorite line from you favorite song? What is your favorite line from your favorite TV show? What is your favorite religious scripture passage? What is your one goal in life that you cannot wait to do? What location would you most like to visit? What movie did you see on your first date with "you know who"? What nickname did you give your high school teacher behind his/her back? Where did you go on your most memorable date? Who gave you your high school nickname? Who is your favorite hero or heroine? Who was the judge for your traffic court appearance? With what famous person did you share an airplane ride? With whom did you attend your first concert?